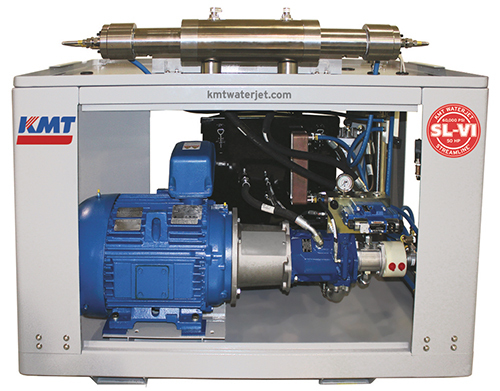 KMT Waterjet Systems Inc., Baxter Springs, KS, a manufacturer of ultrahigh-pressure pumps and components for waterjet systems, introduces the Streamline SL-VI Series pump. Available for delivery in January 2015, in 30-, 40- and 50-hp models and operating pressure of 60,000 psi, the new pumps reportedly will offer enhanced efficiency and productivity with predictable maintenance schedules. Depending on the application, the Streamline SL-VI Series waterjet pump can be custom-built based on a variety of options to meet specific cutting requirements. Key features include enhanced performance with increased intensifier flow rate, and the NEMA Premium Motor design for optimized motor efficiency and reduced electrical consumption. Options include a top cover guard interlock design with a safety performance standard rating of PL a; 60,000-psi redundant top works; and power factor correction to reduce electrical demand and operating costs. The pumps also offer a universal design based PLC and HMI platform used for the control of the intensifier pumps. The dashboard control panel features universal icons for quick recognition along with pump performance information displayed in multiple languages.